Academy Village Tucson is unique. Activities cover social, physical and learning. Explore your interests. Local geology, a yoga class, concerts or social events. All are available. Academy Village Tucson residents are active. Their efforts have build a community that offers wellness, fitness and intellect. Home owner fees at Academy Village Tucson support its programs and services. Fitness programs, security, modest transportation services and common area maintenance. Academy Village offers a broad collection of services. For a complete list of services provided use the link for HOA Services. Committees are opportunities to “get involved”. Residents take part in setting the direction of the community. The Academy Village Tucson reflects the vision of its residents. The community center is where activities and events take place. Meeting and seminar rooms are available. Activity rooms have natural light and stunning mountain views. The Arizona Room is a focal point in the community. Meet with friends for afternoon gatherings, concerts or large group events. The Academy Village Tuscon Cafe offers lunches, dinners and meals on special occasions. 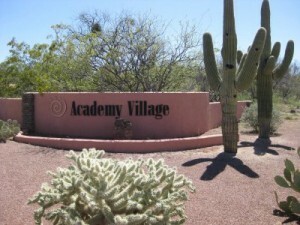 At the heart of Academy Village Tucson is The Arizona Senior Academy. They are focused on creating a life long learning process. Educational and cultural programs support the community. Programs, services and social events are sponsored by the Village Homeowner’s Association. Academy Village is a unique living experience. This includes assisted living in Academy Villas. All Arizona Senior Academy programs are available to residents of Academy Villas. The Academy Village provides an opportunity to explore unique lifestyles. Come and visit for a three or five night stay. Review the Preferred Guest Program to explore your interests. Call Us 866 316 5575 OR complete the – CONTACT FORM – and we will get right back to you!